The Ceylon Covered Bridge is located on CR 950 S. at Limberlost County Park in the county area outside of Ceylon and Geneva. 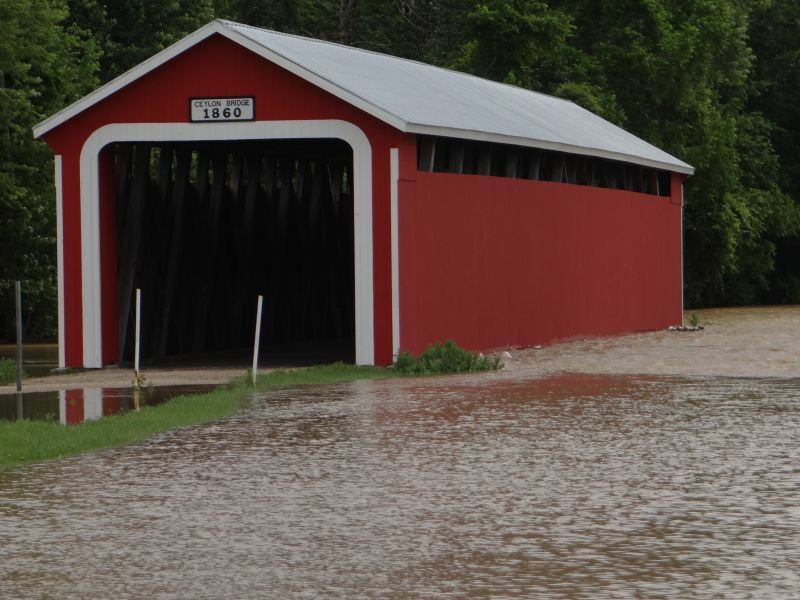 Originally and historically known as Baker Bridge, it was built in 1879 by Bridge Smith Co. of Toleda, Ohio, and was one of 23 covered bridges spanning the Wasbash River. 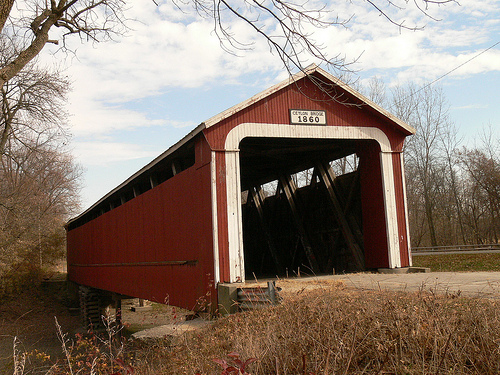 Today, the Ceylon Covered Bridge is the last remaining covered bridge over the Wabash, and was added to the National List of Historic Places in 2007. ​Running 135 feet long, the Ceylon Covered Bridge was fabricated using a Howe Truss design. A Truss Bridge is one whose superstructure is composed of a truss, or a structure of connected elements forming triangular units. A Howe Truss is formed using wood on the diagonal parts of the triangle and iron (and later steel) on the verticle parts. More commonly built in earlier times but carried over into the day of steel bridges, the Howe Truss style bridge is exceptionally strong, making it a favorite choice for Railroad Bridges. It was also cost efficient as it used the cheaper material (wood) on the longer diagonal parts, and the more expensive material (iron or steel) on the shorter vertical parts. Originally designed to take CR 950 S. across the Wabash River, the Ceylon Covered Bridge was closed to vehicle traffice in 1974, and CR 950 S. was later routed around it. The bridge received its first major set of repairs in 1963, and received a complete overhaul in 2012. United Surveying, Inc. (USI) completed the rehabilitation project in July of 2012, with the goal of improving all structures to current safety measures while restoring the bridge to as-close-to-original condition as possible. USI replaced the roof, all verticals, upper and lower chords, timber deck, bearing shoes, and floor beams; they also replaced and painted all the siding, repaired or replaced the diagonals, and repaired the abutments. After the restoration was complete, the Ceylon Covered Bridge was reopened to the public, allowing for pedestrian and bicycle traffic as well as community gatherings and events. Not all the information available about the Ceylon Covered Bridge is historic, however: this bridge is often found on lists of haunted placed in Indiana. One such story tells of a grim event happening there, although there is of course no factual proof. Local lore states that a group of teenagers performed a séance on the bridge many years ago. During the séance, a body supposedly fell through the roof, leaving a large blood stain on the floorboards by the pentagram drawn by the teens. Perhaps this is why it needed restoration. During the 2000's era, the bridge was actually dismantled piece by piece, taken away, and restored piece by piece. The bridge was then re-installed upon a new foundation. During a flood in 2004, the Community was afraid the bridge would be lost as the Wabash River rose to record flood levels. However, after a historic 6"+ rain event in a short time, the river crested and the bridge continued to stand.